These three young Junior High Schoolgirls are Miko, or shrine maidens, and are taking part in the procession of the mikoshi at a matsuri. Before the procession they had performed Miko-mai, a sacred dance in the shrine. These miko are volunteers, and just train for this performance. At many of the larger shrines that have full-time staff you may see older Miko, working in the shrine shop or office. Nowadays the only requirement to be a miko is being unmarried, though in earlier times it was necessary to be a virgin. Before that shrine miko were pre-pubescent girls who retired at the onset of puberty. In Izumo the tradition was different, and miko remained miko all their lives and passed on the function to their daughters. Nowadays many miko are daughters of priests. Miko also assist the priests with ceremonial duties as in the photo below where a miko is performing Oharae, a purification ritual. There are a few female priests in Shinto, but not many. Another type of miko no longer existing were the wives of Shugenja. The miko would go into a trance under the control of her yamabushi husband. Miki-san, the founder of the Tenrikyo religion was functioning as a stand-in miko when she began to have trance. Shamanesses and priestesses were probably the norm in ancient times before the influence of Buddhism. When I go walking and exploring I usually follow a route that takes me from shrine to shrine. Sometimes, in remote areas, the maps are outdated and the shrines no longer exist. This shrine is close to the center of Miyoshi, and was abandoned. The torii had been taken down, the shintai removed from the hondens, but the buildings were still intact, though boarded up. I checked on Google maps last night, and now these structures have been razed. I haven't been able to find out why. Sometimes shrines are moved to make way for construction of roads, tunnels, etc but this was not the case here. It was a fairly substantial shrine too, with several secondary shrines in the grounds. The Shimane Arts Center in Masuda combines galleries and performance spaces. Opened in 2005, and designed by Naito Hiroshi, the rectilinear boxes of the design is unusual in being clad by more than 250,000 rooftiles, hence the building is commonly known as Grand Toit, from the french for big roof. The rooftiles were made up the coast at Gotsu in the reddish-brown color typical of the region. Externally the design is not particularly noteworthy, but inside is spectacular. Here are some of the veggies I've been picking from my gardens this month. Known as ninjin in Japanese, carrots were introduced from Europe through Nagasaki in the 19th Century. They grow pretty much all year round, but my main crop I plant for winter harvesting. Most people round here have never seen beets, though the leafy variety known as Swiss Chard was introduced in the 19th Century. Hokkaido now grows a lot of sugar beets. As with carrots, my main crop I grow in the Fall, and mostly I pickle them. Pickled beetroot can not be bought in Japan. Tomatoes were introduced by the Portugese in the 17th century, though improved strains were introduced from the USA in the 20th century. This variety of yellow cherry tomatoes I hadn't tried before. The larger red tomatoes are just starting to get ripe and I'll be picking them continuously until November. Of course we have also been picking kilos of green peppers and eggplants! This is not a very common kagura mask, in fact the only time I've seen it used in a performance is with our village's kagura group. One of the dances they perform every year at the all-night matsuri is Yorimasa, and part way into it the stage is suddenly invaded by a family of monkeys. The adult monkeys chase into the audience and grab unsuspecting young kids,... older kids have seen it before so they stay out of the monkeys' reach. The baby monkeys are played by 3 and 4 year old kids. It's they who wear this mask. Most groups matsuri performances will include some form of pantomime or audience participation. Around here kids start early with kagura. In a few places girls have started to take part, but mostly kagura is still for boys and men. This mask is, of course, for sale at an unbelievably low price!!!! This manhole cover is from Saigo, the largest town (pop 13,000) on Dogo, the largest of the Oki Islands lying off the coast of Shimane. The design is fairly simple and straightforward,...fish! Being small islands, fishing is the mainstay of the economy for the Oki's. Also its a very popular destination for hobby fishermen; more than half of the passengers on the ferry are usually carrying cooler boxes and rod cases. I've thoroughly enjoyed myself every time I've visited the Okis, and all the food we ate there was really tasty. The village of Ichiki lies on the upper reaches of the Yato River at the base of a mountain that has a small ski resort on it. The Hachiman shrine lies in the centre of the village. There are a lot of smaller, secondary shrines within the grounds of the main shrine. There is a shrine to Konpira, a very popular kami that originally came from India, a Kannayago Shrine, the kami of metal-workers, the ever popular Inari, the god of harvests (and geisha! ), and an Omoto Shrine, the local land-kami. Every 6 years Omoto Kagura is performed here. 100 years ago most, if not all, of these secondary shrines would have been scattered about in small local communities. That was the essence of the traditional religion, local, mostly nature-based gods. The government began a program that closed half of the shrines in the country. They didn't close any Hachiman shrines, as the God of War was an important national kami, and that was the point. The small local shrines were all moved into a central "national" shrine, where national rituals and national kami would become the focus of peoples attention. On my walks around the backcountry of Japan I have been pleasantly surprised to see a few local shrines being re-established. Yesterday was the Houranenya Matsuri in Gotsu Honmachi, the old town of Gotsu at the mouth of the Gonokawa. Before the procession started a group from Kawahira, a village between Gotsu and my village, performed a folk dance, the Tauebayashi. The gentleman with the cool hair-do was leading the dance. His mask appears to be a version of Hiotoko, but may be another character. Both men and women performed the dance which accompanied rice-planting in earlier times. It's purpose was to strengthen the rice. 2 years ago there was a full-fledged attempt for a younger male to become Alpha male in the troop. For 2 days there was a lot of screaming and tree shaking by the 2 males as the females sat on branches and appeared to scream their support for one or the other as in a pro-wrestling match. I've been seeing the monkeys every day recently as they are raiding the village gardens. Immature pumpkins are their preferred choice right now. Living as I do in a narrow, steep valley, I rarely get to see the sunrise or sunset, so it was particularly exciting yesterday evening to watch the spectacular sunset over Takashima. We were in Miho Misumi, about half-way between Hamada and Masuda. Takashima lies a couple of kilometres offshore. It is now uninhabited, but was inhabited until fairly recently. Takashima should not be confused with Takeshima! Takeshima is the Japanese name for a group of rocks that lie much closer to Korea than Japan, and are controlled by Korea who call them Dokdo. Currently there is a diplomatic spat between the 2 countries as the Japanese Education Ministry has decided to teach Japanese children that Dokdo belongs to Japan. Japan claimed ownership in 1905 a short while before they annexed Korea and while the Korean Foreign Ministry was already controlled by Japan and therefore in no position to argue. Historically the Korean claim to the rocks is much stronger. Japan has territorial disputes with Korea, China, Taiwan, and Russia..... all of its neighbors! Miyoshi is a large town in the mountains of northern Hiroshima that lies upstream of my village in Shimane on the Gonokawa River. Three rural rail lines meet at Miyoshi, and this has led to its growth. Wakamiya Hachimangu is not far from the railway station. Hachiman is the God of War, and there are more than 30,00 shrines to him throughout Japan. Hachiman was adopted by the samurai as their tutelary deity, and as the samurai ruled Japan, everywhere they were they built a Hachiman Shrine. We were there in the first week of January, and so the shrine was decorated for Hatsunode, the first visit to a shrine of the year, a popular activity. Many shrines stay open on New Years Eve for the many visitors who come after midnight. The symbol on the purple banner in the photo above is the Triple Tomoe, the symbol of Hachiman. For Hatsunode many shrines will display their Mikoshi, sacred palanquins, or portable shrines. They are used to carry the kami around the community during Matsuri. Many shrines will have statues of horses in their grounds. This comes from a tradition started by an Emperor in ancient Kyoto who donated a horse to Kibune Shrine in return for prayers for rain. A gift of a white horse was made for prayers for good weather, and a black horse when rain was wanted. Over the years paintings and sculptures replaced expensive horses, and this eventually led to the creation of "ema", the small painted boards left at shrines with prayers and requests written on them. This plant is a volunteer in my garden every summer. Known sometimes as Beefsteak Plant in English, but also by its Japanese name of Shiso, it is a member of the mint family. There are 2 species of shiso, green, and red. Anyone who has had sashimi will know green shiso as its leaves are the bed on which the sashimi lays. It is also used in salads, cooked as tempura etc. Red Shiso, pictured above, is used to give umeboshi and pickled ginger its distinctive purple color. It also makes a fragrant, tasty lemonade. Boil the leaves for about 5 minutes, strain, add sugar to taste and then let cool. Add citric acid (lemon juice) and store in the fridge. Shimane Art Museum is located on the banks of Lake Shinji in Matsue City, Shimane. The sweeping curved ceiling is quite impressive, but other than that the interior is not particularly impressive. The view out of the window looking out over the lake is more impressive. There is an Italian Cafe in the museum, and reflecting pillars there offer distorted views over the lake. The museum is a popular spot for watching the sunset and the museum stays open until 30 minutes after sunset. This is the biggest tree in Shimane Prefecture! It is located in a small village just downstream of Nichihara Town on the Tsuwano River. It is a Kusunoki , a Camphor tree, and last time it was measured it had a span of 12.3 metres, and a height of 29.5 metres. I seriously doubt that every tree in the prefecture has been measured :). This is a standard hanya mask in the Iwami Kagura style. I didn't embelish it in any way. I think that some of her sadness shows through her horrific visage. I believe the hanya is the most popular mask bought as protection for homes against evil spirits. It and all my masks are for sale. This manhole cover is from the same village as the bullfighting one, Tsuma on Dogo, the largest of the Oki Islands. This one shows a marine connection, a fairly common theme in Japanese manhole designs. It shows flying fish and squid. The flying fish is the Prefectural fish of Shimane. The first time I saw some I thought I was watching a flock of small birds flying close to the water..... then they disappeared!! A good place to see them is on the ferry over to the Oki Islands. If you stand in the bow and look forwards you will see them flying out of the way of the path of the boat, often flying for 50 metres. The world record flight time or a Japanese flying fish is 45 seconds. The Japanese catch and consume a HUGE amount of squid. It's eaten raw as sashimi ( a little chewy but OK), dried and shredded as a snack with alcohol, boiled, grilled, fried,.... in fact any way you can imagine and probably a few ways you can't imagine. In the Iwami area it is a matsuri speciality (photo above), grilled with a sauce of sake and soy sauce. Ichiki Shrine is approached up a narrow road and flight of steps that run up the hillside from the Yato River. It's a fairly big shrine with a nice "3-legged" torii. The main kami enshrined here is Ichikishimahime, and its possible the village was named after the shrine. Ichikishimahime is a popular kami and the most famous shrine to her is probably Itsukushima Shrine on the World Heritage site of Miyajima, though her "home" shrine is in Munakata in Kyushu. According to the ancient myths she was created in a contest between Amaterasu and Susano. Susano took some of Amaterasu's jewels, chewed them up and spat out 5 male children. Amaterasu took Susano's sword, chewed it up and spat out Ichikishima and her 2 sisters. The girls were taken by Susano, and the boys by Amaterasu. One of the boys is the mythical ancestor of Japan's Imperial line. There are numerous secondary shrines within the grounds, including Omoto, Konpira, and an interesting one to Kanayago, a shrine connected to iron production and blacksmithing that suggests this area was important for its iron. From the shrine there are fine views across the valley to the ski slopes of Mizuho Highlands. Interestingly, it is often said that Ichikishimahime is a child of Amaterasu, cutting out mention of Susano, and yet it is never said that the Imperial line is descended from Susano. One more example of the "hyping" of Amaterasu at the expense of Susano. Yabusame tournaments are held at various locations throughout Japan, but only one is held in an original yabusame ground, and that is the one at Tsuwano at the Washibara Hachimangu Shrine. The course is 270 metres long, with a stone embankment running the length. The festival is held in April, and usually the cherry trees lining the course are in full bloom. Hachiman, the primary Kami of the shrine is, among other things, the god of archery. Yabusame, like Sumo and Kagura, is primarily performed for the entertainment of the Kami, which is why it is properly held at shrines. The morning is spent with ceremony, ritual, and pageantry, and the medieval costumes of the participants combined with the cherry blossoms makes for a very colorful affair. Horse, riders, and all the participants plus the grounds itself are all purified prior to the competition. Once it begins, it all happens very quickly, the horse and rider taking just a few seconds to gallop down the course. The arrows have a heavy, rounded head so a loud "thunk" is heard if the target is hit. Mist fills the valleys and burns off slowly once the sun rises. Books about music are especially problematical when the music in question is not known. Such is the case with this book. How many people know the music of Speed, glue, & shinki, or Flower Travellin' Band? 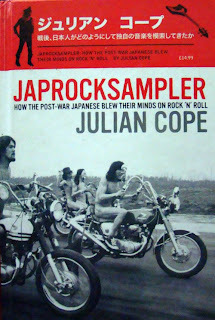 Cope's book on the genesis of Japanese Rock music is fascinating nonetheless and offers insights into post-war japan. Like his earlier book, Krautrocksampler, the former front man for The Teardrop Explodes explores how Japanese rock music was no mere copying of American & English rock, but was subject to a whole variety of cultural, commercial, and political influences. Particularly fascinating to me was the influence of avant garde musicians such as John Cage and Karl Heinz Stockhausen, and in this regard, Yoko Ono's first husband makes many appearances. The pervasive influence of Jazz on other forms of post-war japanese music is also surprising. Politically, Japan's reaction to the Beatles, Japan's drug policies, the closing of the musical Hair, and the band connected to the terrorist group Red Army, all provide insights that help build a more coherent picture of the "scene" in Japan. Cope's writing style I found sometimes too "hip" and frenetic, and the earlier part of the book is more interesting than the latter as there is a lot of repetition, but this an exteremely well-researched book, and gives a lot of information that previously wasn't available in English.